Trail of Terror? Haunted House Event? Mad Scientists? What a fun week of caching! It started out last Sunday with the 6th annual Trail of Terror at the Anza Narrows Park in Riverside. Yes, this is the sixth time that the “Late Dr. HazzMatt” has hosted the event and placed 30-odd caches along the adjacent bike trail with evil and devilish themes. I know that to most locals, this is a humdrum, paved, flat exercise course along the sandy, mostly dry riverbed, but for me… it’s the creepiest place around! I’ve only ever been along it to find these spooky caches, so all I have in mind as I walk here are the creepy cache pages and gory cache containers! I did this once the week after the event all by myself on a foggy day… now THAT was scary! I was in good company this year: f0t0m0m, Team Perks, and the Ventura Kids. We were also surrounded by all of the other attendees, ahead, behind, on foot, on bikes, on broomsticks… well… no broomsticks. … and there they are out there looking for the cache! This was one of the more creative new hides this year… ew! DBRambling generously provided water and oranges for everyone at the midway point! Here’s Hazzmatt, mysterious as always…. …. and yes, I did buy a T-shirt! HDGC Annual Dinner #3 @ The Cajon Pass Summit Inn! Welcome to the Mad Scientist Laboratory! Um… I had a regular steak sandwich. Then, to the Tevis Clan Haunted House! It was too dark to get any good photos, darn it. The Tevis family puts on an amazing experience, full of axes, body parts, ghouls jumping out at you, chain saws, evil torturers, black lights, thunder and lightning… wow. I had a blast getting the adrenaline pumping there with BWidget and Albackore! and here I am holding a florescent tube that’s lit up without being plugged in, but only from the ambient electricity in the air! Have a fun and safe Halloween! Hope it’s full of caches and candy! A couple of days after my big birthday and the record run, I was recovered enough to summit my third 14er – that’s a mountain over 14,000 feet tall. The first was White Mountain back in ’07, and that was a 10-hour hike after two nights of sleeping at elevation. The second was Mt. Shasta last summer, a grueling, exhilarating 14-hour day after about a week of acclimation in the Eastern Sierras and on the mountain itself. This one took, um, about an hour. Pike’s Peak has a road to the top! This would be the end of the line! As you can see, the view was pretty hazy that day, but my cousin says that on a clear day, you can see – not quite forever – but the whole Rocky Mountain range. This is the view from the first cache. That’s my cousin, Richard, over there. I even got to play in some snow… in August! Here’s to more caching high points and peak experiences! It’s raining this week here in Southern California. I have gone caching in the rain, and it can be fun, but it is largely a disincentive to get out in the traffic and mud and wet bushes. Earlier this week I did have a couple of adventures I’ll discuss in a moment, but first I’d like to share a couple of links I stumbled upon while surfing the web (sort of indoor geocaching with no smilies?) yesterday on a site called EZine Articles. This site has thousands of short pieces on every subject imaginable written by experts on their respective subjects. I’m considering submitting a few articles myself, such as “How to Find Over 400 Caches in a Day” and “A Guide to Geocaching in Southern California” and so on. Do any of you have any suggestions? I know many of my readers are more expert than the EZine contributors – feel free to write something, too! If you don’t feel like you can write it yourself, I’m happy to co-author as well. I celebrated a big number with GeoCraig this week: his 5000th find. We took a hike up Chumash Trail north of Simi Valley with Gummyfrog, Capdude, Capsbug, and Don J. It was a perfect coolish fall day with fog followed by sunshine. Resistance is Futile This one had an unusual visitor a couple of days later! If you haven’t subscribed to his blog yet, check it out! I do pretty good with my Canon SureShot, but Craig really takes some superlative photos. His latest entry features some of his best from his five thousand finds. I’m not so sure about this one, though…. Huh? Is there a link there? YES. Click the dot. Have a laugh. 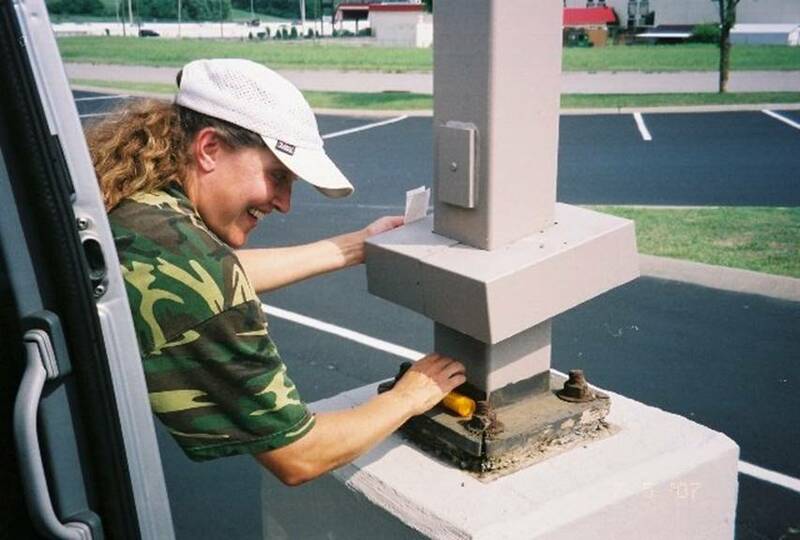 Here’s to the high entertainment value of geocaches AND geocachERs! I’ll get to the caches around the world later, meanwhile, I headed out earlier this week for an afternoon of caches near my house. I’ve had a goal for a long time to clear out a 10 mile radius, but I’ve never gotten that completely done. I do manage to keep about an 8 mile circle clear, though. This baker’s dozen had sprung up fairly recently, including some nicely designed ones by a newer cacher, Minifish. I met the cache owner at the next cache, as he’d noticed my logs. ( I was posting from my iPhone as I went; I love doing that, because then I have no “homework” when I get home.) He’d gotten a lot of flak about putting cache in a No Trespassing sign… (duh)… and it’s now archived… but because the sign itself disappeared! Go figure. I love these itty bitty ammo cans, though. The cache is right behind him! Bad Boys!! Watch gonna do?? Love the flat caches, and it was a bit of a search before I went to that idea. I forgot to take a photo here. Wandered around for a long time under the trees. Eucalyptus are particularly bad for scattering the GPS signals. After finding someone’s stash of bad videos, I called for another lifeline, then found it rather handily. A short walk up one of the canyons in Porter Ranch led me to a container with a funny pun on it, but I won’t give it away. Have a great caching week! It IS all About the Numbers (Sometimes)! One of the comments I got on my post about finding cache #20,000 was what some of my statistics look like. I ran an “all finds” pocket query, and asked f0t0m0m to run it through his GSAK (Geocaching Swiss Army Knife) program. Some of the results are fun, some are just, er… boring… but here’s what 20,000 caches looks like all taken apart. I started at the end of May, 2003, for 6 years, 4 months of caching is 3,158 finds per annum. This is also about 263 per month and almost 61 per week. Now that’s not TOO crazy, is it? Ha…..
OK, as most of you know, the most I’ve found in a day with a team is 413. I also found 111 solo with no lifelines and 16 DNFs a couple of years ago in Escondido in about 16 hours. That was a “I’m glad there are so many light pole caches here” kind of day! The furthest away I’ve been caching so far is in Sweden (the one listed below is an old armchair cache). The highest up is 14,252 feet on the summit of White Mountain in the Eastern Sierras. I like the following table in particular. The only way to find so many is if LOTS and LOTS are hidden! Many thanks to these and ALL of you cache hiders! 539441 km, Note: excludes locationless caches. 17953 km, on 05/24/2005Note: excludes locationless caches. N 35° 27.889 W 116° 46.623 MapNote: excludes locationless caches. I’m still missing 16 US states and about 1/3 of the Southern California Delorme challenge (GC18M1N), even though I have found a cache in every county in California. This alone means there are still more caches to find and still reasons to find them… and NOT just the numbers! Here’s to the adventures that hide in these statistics! Where to next? Around the corner? Around the world?